Legion: Siberian Story deals with the topic of civil war and the meaning of words such as heroism, home and human being in a time of turmoil. A volunteer army of an emerging democratic state is trying to get home from Siberia in the time of the Russian Civil War and must face many struggles and difficult choices in the process. The game is set around Christmas 1918, in a time when the war in Europe has already ended. The characters in the game do not portray any real historical figures. We are aware that there can be many differences between larp cultures and traditions in Europe. In the following tabs we will try to describe the playing style of our game to bring everyone on the same page; however, we are possibly not aware of all the problems which can arise. Please, if you have any questions or objections, don’t hesitate to ask us either on our email: legion@rolling.cz or our FB page. 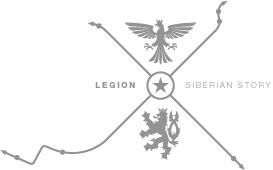 Legion: Siberian Story is a game which combines both playing roles of characters in a time of crisis and a march through a stretch of terrain, together with inevitable military action. We want to tell a story of ordinary people in a critical situation. We want you to have a feeling that you were there. We want strong emotion, big conflicts, and sensitive relationships. We do not aim for a perfect military or historical simulation: both are merely props for telling your story. The march itself is indeed mostly an atmospheric tool, although it means that the game requires the players to be physically fit to a basic level. The game is therefore not suitable for people with limited mobility. During the game (Friday half-day and Saturday the whole day) the players will march around 20 kilometres through terrain; there will be frequent stops. Different characters have a differently physically demanding game; the registration form will allow you to choose how physically demanding you want your game to be. Therefore, while the soldiers will be fighting and shooting and the Red Cross nurses will be running to save the wounded under fire, the civilians can expect fewer physically demanding activities - but they will have more relationship play and often also more connection to the location to compensate for that. When creating the game we made some concessions to the historical reality: the game is thus not so much of a faithful reconstruction of what happened, but rather a collage of stories, fates, and situations, which can be found in this topic. It is also not at all necessary to study complex historical facts in order to be able to play the game - you will be provided with all the necessary information before the game. The First World War changed the old order and replaced it with a new one. The idea of an independent Czechoslovak state found its supporters amongst the Allies and tens of thousands of volunteers fought for an independent Czechoslovakia, free of the Austro-Hungarian rule. A large portion of these volunteers fought on the Eastern Front as part of the Russian Imperial Army. But the Tsarist Russia collapsed and sank into a civil war which lasted long after the war in Europe ended. Suddenly, the Czechoslovak volunteers had to stand against the Reds, the Communists, and make a utilitarian alliance with the Whites, an ambiguous association of monarchists, autocrats, dictators, and democrats. Our game starts when one of the Czechoslovak Legion's military trains is setting off for another part of its journey. But something goes awry, there is an unexpected ambush and the train leaves - without everyone on board. A few minutes after that a group of survivors forms up, consisting of the remnants of several units, including the field train, the Red Cross and the prisoners of war. And that is where the journey of our heroes begins - hopefully it will end by a reunion with the rest of the Czechoslovak army. They will have to make their way through a lawless land; a land in the midst of civil war, where yesterday's alliances mean nothing. Where will this journey lead them? How will their story end? You will decide that! We believe, that although the game is focused on the stories of Czechoslovaks and the civil war, it can also convey strong messages about much more general and universal topics of its time. About ideology, war, and people. What we want from the game is to create strong stories together and for each other in a setting simulating Siberia and the civil war. We want to give the players interesting and powerful experiences and a feeling of “having been there”, as well as some food for thought. It is not possible to win the game, but it is also not the goal to just create as many cool scenes as possible regardless of character integrity. The game does not support gamist playstyle; we try to encourage each player to create a coherent and powerful story throughout the game for her/himself and other players. The game is very much of a “come and play” sort and only light preparation is expected of the players. You will get a full character sheet and you will not be asked to participate on writing it; however, we will ask you to read it thoroughly, think about your interpretation, and consult any issues that might arise with the organisers. We will also not expect you to study detailed historical information on your own; we are aware that this historical setting is probably not very well known and we will supply you with our own comprehensive materials, summarizing what you need to know and what might be useful. There will also be a workshop before the game to sum up the basic historical knowledge in a participatory manner, together with contemporary social norms and typical behaviours. We will provide costume, food for the whole game, all props and guns and equipment (including food equipment). You will only be asked to bring good walking shoes, a plethora of warm undergarments, and sleeping equipment. Our game is not transparent and it works with surprise and secrets. We are aware that this is unusual in many larping cultures, but we believe that the lack of transparency in our game has a purpose and that we have ways to make it work. We ask you to trust us in this. The characters have their secrets. The secrets are to be revealed, but in time; and we believe that the game works well if the secrets are a surprise for both the characters and the players. Therefore, before the game you will be asked to debate your gaming preferences and set intimacy levels and physical boundaries with your close in-game partners, but please do not include “spoilers”; do not send them your character sheets or tell them what your character thinks about theirs and what you’re planning to do about it. If you are unhappy about something in the game, want to make a major decision, which might influence your co-players, or want to tweak something in your in-game relationships, please go to talk to your consulting organisers; they know the game really well and they will work out a way to make you and your co-players happy. However, please do not go to have an off-game chat with another player. The game also includes fateplay to some extent. Each player will get a “diary” before the game – inspired by the real diaries that the legionnaires used to keep. For each location that the march will stop at, the player will get a few lines of text. In many cases, they will just be our suggestions, food for thought and possible inspirations, which the player can decide not to pay any mind to, if they do not work in their game. On the other hand there will be some (clearly marked) orders, which the player must obey and find a way to play them out. In this case we also do not work with full transparency and we ask the players not to read ahead. There are various surprise elements coming into the game at each location and we think it is good when the players do not expect them fully. Another thing possibly not common in other larp cultures is the role of the organizers. We will have two so called “consulting” organizers: NPC-like characters marching together with the players, who normally just play low-key characters with no major in-game role. However, their main role for the players is that of a consultant; they will be there for you. They are there both to check on safety and practical comfort of the players (so you can approach them if you are hungry, sick, cold, too tired, your equipment has gone faulty etc.) and to help the players with their game. We will ask you to check in with these organisers at least twice a day to have a brief talk, privately, off-character, about how your game is going. You can (and please do) go to them whenever you are unsure about how a suggestion or an order in your diary should work; when you want to do a major decision or take a step very different from what you have in your diary and you are perhaps unsure about the impacts on other players or timing; when you feel that another player has been ignoring you or underplaying you; when you feel bored and don’t know what to do; when you feel down about your game, uncomfortable about some element of it or in any sort of mental unease. We are aware that this may seem as limiting the players’ freedoms, but the consulting organisers are really there only to consult; to give advice and to make sure that everything goes smoothly for you. They will not tell you what to do, give you orders or limit your options – they simply know the game well enough to help you with any trouble, so you do not have to take other players off-character. They also act as a mental safety safeguard - if something gets too much for you at any time, you can let them know and they get you to our experts and help you sort it out. Legion: Siberian Story strives for a fairly high level of visual immersion: we will ask you not to have any modern objects (mobile phones, plastic bottles) visible during the game etc. However, our goal is not a full historical reenactment or military simulation: both history and the military feel are means to an end for us. Costumes and props will not be historically accurate. Similarly, it is entirely all right for participants of both the runs to have modern equipment (hygiene supplies, medicines, modern snacks) hidden in their packs, and while we somewhat prefer contact lenses to glasses, wearing glasses is also no problem. That means that there will be some disturbing elements as well: the route goes through several short inhabited pieces of modern countryside, so it will be possible to see some modern houses, maybe glimpse cars, etc. We will also have one or two photographers with modern cameras going with the unit; please ignore them, they will not try to interact with you, but they will yield pretty pictures of you in cool uniforms later on (for that reason, please do not use your own cameras during the game – you will get pictures nevertheless). The game does have some basic requirements for physical fitness (you have to be able to walk over 20 kilometres in winter in terrain; however, there will be many stops). It also includes physical play of violence and some intimacy. There will be mechanisms for them which allow for visual believability and safety at the same time; they will be explained at the workshops. The game will also include gun replicas (sound guns) and some fighting with cold arms (not latex, but softened wooden weapons – safe and commonly used in the Czech Republic, but with wooden hilts). The workshops will include a general briefing on safety and gun manipulation. There will also be mechanisms for physical brawling, wrestling, any bullying, which we will go through in the workshops. They work with a very low degree of physical force, but a fairly high degree of physical contact and we do ask all our participants to comply with the safety measures presented in the workshops. The game plays out some uncomfortable topics relevant to the historical period. Sexism is common in the game, as well as nationalism and xenophobia. There will be characters which are bullied and discriminated against and characters which bully and discriminate others. It will be possible to set your preferences regarding these topics in the signup questionnaire, but please be aware that you will meet with these topics in the game quite frequently and please be prepared to play on a set of period-appropriate prejudices and viewpoints that very often conflict with our present ones.